The Elusive AFL Quadruple Double Mk II — The Mongrel Punt Become a Patron! It’s been 12 months since we checked in with one of our favourite AFL stats - the quadruple double. Double figures in kicks, handballs, marks and tackles sounds simple, right? Basketball has long-celebrated the triple double. Names like Oscar Robertson, Wilt Chamberlain, Magic Johnson and more recently, Russell Westbrook have made this category their own over the years. In 2017, Westbrook broke the all-time record for most Triple Doubles in a single season, grabbing rebounds, assists and points at will, and this season is averaging a triple double again! However, when you add just one more statistical layer to the mix, those able to achieve the ‘next level’ feat drop off dramatically. Only four players have been able to pull off a Quadruple Double in NBA history. Nate Thurmond, Alvin Robertson, Hakeem Olajuwon and David Robinson are the only men ever to climb this mountain, and each has only done it once (Hakeem almost had two but had one rescinded once the game was reviewed and the NBA deducted an assist). Thurmond was the first to achieve this in 1974, and Robinson was the last man to pull it off, twenty years later. No one has completed it since 1994. In the last 25 years, we've seen none. In the AFL, the quadruple double is almost as elusive as it is in the NBA. As it currently stands, only six players have been able to compile enough numbers across the range of four specific categories to qualify as Quadruple Double players. I don't think this kind of thing "Americanizes" our game more than the advanced statistics we use now already have. We now count goal assists and score involvements. This is more a fun kind of stat - the sort that captures a player's influence in a number of areas, and occurs so rarely that it deserves to be celebrated when it does. But why limit it to just these four specific categories? Why not allow clearances? Why not allow contested possessions? Well, they’d be doubling up, wouldn’t they? A clearance would be either a kick or handball, so in one action, you get to tick off two categories. It doesn’t sit well with me. To be completely fair to those who came before, we’ve opted for only standard statistical categories. There’ll be no pressure acts, inside fifties, rebound fifties, 1%ers or hitouts included to make it easier to achieve. What we’re looking at is the pure nuts and bolts of the game. Kicks, handballs, marks and tackles. To achieve a Quadruple Double, those are the designated categories a player must record double figures in. Want to support the site? Grab a Mongrel Bumper Sticker and spread the word. We’d really appreciate it. To demonstrate just how difficult this achievement is to obtain, it is worth looking at timelines. 2008 saw the first Quadruple Double realised. One more was added in 2009, then another in 2011. Two were achieved in 2014, and the last one recorded to date was in 2015. With players now tackling more than ever, you’d expect that we will see the Quad achieved more often, but as it stands, this is an incredibly difficult statistical milestone to reach. The first to pull it off was Scott Thompson for Adelaide. In Round 9, 2008, Thompson recorded the inaugural Quad against the West Coast Eagles in Subiaco. Sadly, his huge night was wasted, as the Crows fell to West Coast by 50 points. The second man to hit the statistical Everest was Joel Selwood. In Round 17, 2009 Selwood led his Cats against the Hawks in front of 64,000 at the MCG. As became a Selwood trademark, he elevated his game against his bitter foes, and walked away with his most complete game to date, helping to drag his team across the line in the dying moments. Next up was a player who was maligned throughout a lot of his career. Mostly by supporters of his own team. Brent Stanton actually has several near-Quadruple doubles, but only hit the mark once. In Round 19, 2011 Stanton showed why he was rated so highly by those within Essendon. While Collingwood gave the Bombers a belting, Stanton was one of only a few stand up and walk off the ground with head held high. 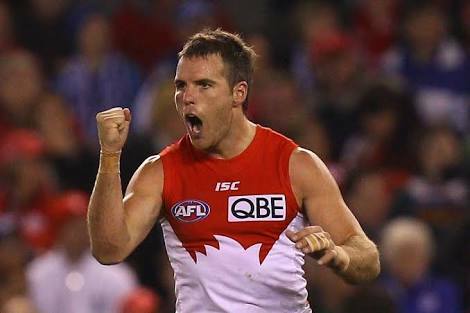 A three year drought of Quadruple Doubles was broken in Round 5, 2014 when Ben McGlynn resurrected the stat for the Sydney Swans. McGlynn was instrumental in the Swans victory over Fremantle at the SCG, his forward pressure and fierce intent on the ball and whomever had it in their possession saw him join elite company.. There was no drought following McGlynn’s effort, with Tom Rockliff adding a Quadruple Double to his CV in Round 20, 2014. In a game completely dominated by the Adelaide Crows, Rockliff’s statistical masterpiece is somewhat lost. It’s hard to find things to celebrate when you’re being creamed to the tune of 105 points, but Rockliff’s individual game deserves recognition. Rocky has also been close on several other occasions and remains one of the two active players to have a Quad under his belt. Finally we come to the most recent man to achieve a Quadruple Double, Corey Enright. Enright was all class as he aided the Cats in their defeat of Collingwood at the MCG. It is worth noting that at this stage of his career, many were talking about retirement for Enright. This performance may have just convinced them that he had one year left in the tank. If it didn't, I'm not sure what else could have. There are a few who flirted with registering a Quadruple Double in 2018, only to fall marginally short. Jack Redden almost added his name to the list in the Preliminary Final, with a 19 kick, 12 handball, 13 mark and 9 tackle performance. Angus Brayshaw fell two marks short against the Eagles in Round 22. He finished with 16 kicks, 10 handballs, 10 tackles and eight marks. Even the all-conquering Tom Mitchell couldn’t add his name to the list, finishing with 18 kicks, 32 handballs, 13 tackles, but only nine marks against GWS in Round 15. Pretty poor effort, huh? With Mitchell now sidelined, who amongst current players is likely to achieve this lofty goal? Tackling is the key aspect to collecting a Quadruple Double. The ten kicks and handballs are seemingly easily obtained by any quality mid in the AFL and with many kicks going backwards to set up play, marks are not too difficult to come by, especially for those who drop back behind the play as part of a designed defensive structure. Dev Smith led the league in tackles in 2018, but didn’t top 10 marks in a game. The closest he got saw him fall two marks short of the total. His 17 kicks, 14 handballs, 13 tackles and eight marks against Collingwood in Round 16 was as close as he’s been. Chris Mayne enjoyed a career resurrection in 2018, and in Round 8 against the Cats, he fell just one tackle short. His 10 kicks, 15 handballs, 10 marks and nine tackles were a statement that the struggles he had in 2017 were now behind him. And Toby McLean fell just one mark short against the Pies in Round 10, notching 23 kicks, 10 handballs, 10 tackles and nine marks. Young mids would be the ones to keep an eye on, for mine. Clayton Oliver and Patrick Cripps could easily be the next to add their name to the elite club. Josh Kelly is another. His career-high total for marks is nine, but he has accumulated ten tackles on six occasions. As a smokey, I’d look at Elliot Yeo. He has toyed with the Quad, notching a game against the Dees where he fell a mark and two handballs short. He has the workmanlike style that is required to be a constant threat to bag a Quadruple Double. So who have you got as the next member of the Quadruple Double Club? Will Joel Selwood or Tom Rockliff become the first players to ever achieve the accolade twice? Will someone come from the clouds to make this stat their own? Or are you shaking your fist at the computer, Shelbyville-Style, thinking we've Americanized our game too much already, and should we leave this kind of stat alone? The Mongrel would like to thank the unsuspecting guys and girls on the BigFooty Statistical Page for doing a lot of the legwork in terms of this stat. They have kept tabs on this statistical rarity and those who have come close for several years. Many thanks to you all.